Cleveland Area History: Cleveland Nightlife in the 1930s? Image used courtesy of Rachel Davis Fine Arts. When I came across this watercolor by Edward Dobrotka in Rachel Davis Fine Arts' current auction, I knew it was special. It looked, to my eyes, like an excellent illustration of the bustling nightlife on a commercial block in Cleveland in the late 1930s or early 1940s. Dobrotka, a Clevelander, is best known as an illustrator in some of the early depictions of Superman, created by Clevelanders Jerry Siegel and Joe Shuster. As a student, in the late 1930s, he was employed in a National Youth Administration (the NYA was a division of the Works Progress Administration - the WPA) program, making paintings, primarily watercolors, of historic buildings in the greater Cleveland area. These paintings provide an excellent way to see these historic buildings in color - subjects that, for the most part, have been lost, and for which the only other documentation is in black and white. About 60 of these paintings, by Dobrotka, are in the collections of the Western Reserve Historical Society - one can obtain a full list by searching for his last name in the museum's catalog. This painting provides a vibrant view of city nightlife in the late 1930s, in the way a photograph never could. People stand around, perhaps waiting for a streetcar, in front of a store whose name I can't read. To the right, there's a fruit and vegetable market, still open at this late hour. To the right of that, with a tiny doorway, Sing Long Low Chop Suey. On the far right, a store sign lists butter, eggs, and cheese. The question that's been bugging me is as to the location being depicted. While it's an attractive painting, and valuable as a historical record of the work of an artist, its value as a record of a place is minimal until we can determine just what that place is. The obvious clue would be to look for Sing Long Low Chop Suey. I don't see any advertisements for an establishement with this name in the pages of the Plain Dealer. 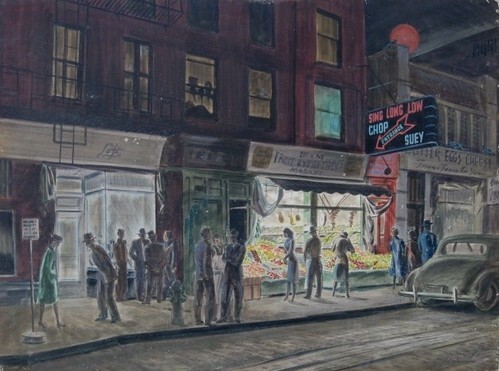 I've come across a reference to a "Sing Long Low Chinese Restuarant" in New York City", but the name doesn't seem sufficiently uncommon to rule out Cleveland as a possible location for this painting. There's enough information in this painting that we should be able to place it on a map, if it is in Cleveland. Streetcar tracks are visible in the road, which narrows down the location. The combination of a 3 story plus brick building, a tiny one story one, and a two story one to the right has to be rare when combined with the streetcar tracks. With enough combing of the Sanborn Fire Insurance Maps for Ohio, one should be able to locate the site. To further narrow this down, I looked at the areas that Edward Dobrotka covered in his paintings for the NYA. 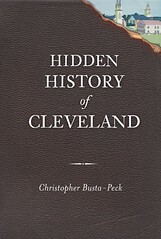 They're primarily in the Ohio City neighborhood, the Flats, and on the near east side (west of, say, East 40th Street). If this is, in fact, Cleveland, it would seem likely he painted this in one of the aforementioned areas. What do you think? Do you have any ideas as to where this might be? New York readers, do you have any clues? For a second I thought it might have been these buildings on Coventry (http://www.cyburbia.org/gallery/data/526/medium/1cleveland_heights_coventry_035.jpg) but once I compared the two it was pretty clear that wasn't the case. Your blog posts are amazing. I've spent a long time considering this scene and my personal opinion is that it is not a Cleveland street scene. This feels much more like NYC than Cleveland. And I make that statement after VERY carefully reviewing the circa 1925 Ostendorf-Nesbit map of the Cleveland Downtown business area. This map shows every business in downtown Cleveland at the time. Yes, it looked very similar to the way NYC looks now (wall to wall stores on every street). Though I did find many interesting things after looking at the map more closely than ever before (i.e. Russian Bear Restaurant, 1222 Huron), there was not a single vegetable market and not a single chop suey restaurant on the map. But I want it to be in Cleveland! Surely that must be worth something. There are a couple of things I noticed as well, though this may have been solved by now. First the curb has a noticeable jog, it is slight but the artist was careful to include it. I can't tell if it's a little bump out of the sidewalk or if the width changes there and continues. The other thing is the direction of the parked car. Could this be a one way street? Or might it have been typical to park facing the wrong way. I think i could get a pretty good date by the car from a friend of mine I'll let you know. I should note that it has been located, in NYC, by commenters on Facebook. I'll be doing a follow-up story before too long illustrating the exact location.